The Portland Spirits Society is headed to Biddeford for our August event on Monday, August 10th at 6pm. The newly opened Round Turn Distilling is producing an amazing, unique gin, so we'll be learning from Darren the Distiller about his product. RSVP on facebook or shoot me an email: blueberryfiles at gmail dot com, if you'd like to carpool. Ladies only, please. 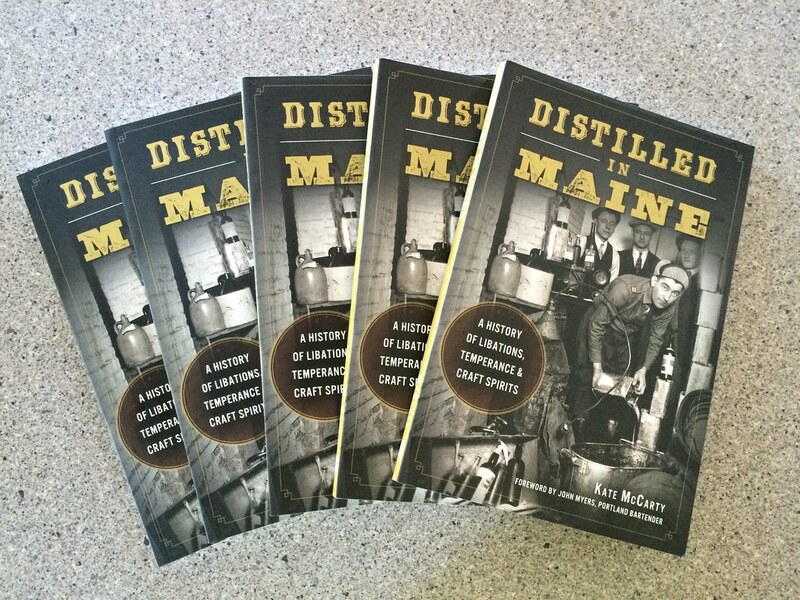 I'll be at Sweetgrass Winery & Distillery in the Old Port (324 Fore Street) with copies of my book, DISTILLED IN MAINE, for sale and to sign. Come see me this Saturday at 2pm! Phew, it feels like summer in Maine again! I was getting worried. OK, OK, I was getting grouchy. Someone just asked me, how's your summer going? And I realized my answer depends on the weather. When it's warm and sunny? Great! When it's 60 and I have to wear a sweater? Watch out. I know, I know, summer in Maine is the best, bla bla, all that. But what if it's not...then what? There are some serious expectations to be fulfilled, and when the weather doesn't deliver it can get ugly. But here we are in a sunny, 80-degree stretch, and our sailboat has been freed from boat jail (aka the repair shop), so the livin' is easy. 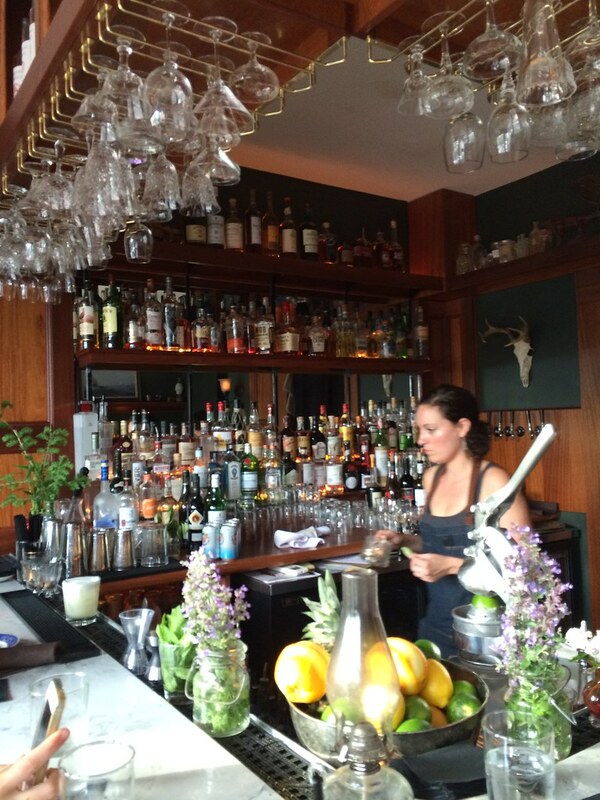 I checked out the bar at Union, the restaurant in the new-ish Press Hotel, downtown Portland. The former home of the Press Herald offices, this boutique hotel is seriously swanky. There's midcentury modern furniture as far as they eye can see, muted colors, and lots of textured fabric. The bar is a beautiful slab of marble, and the cocktail list is approachable but intriguing. 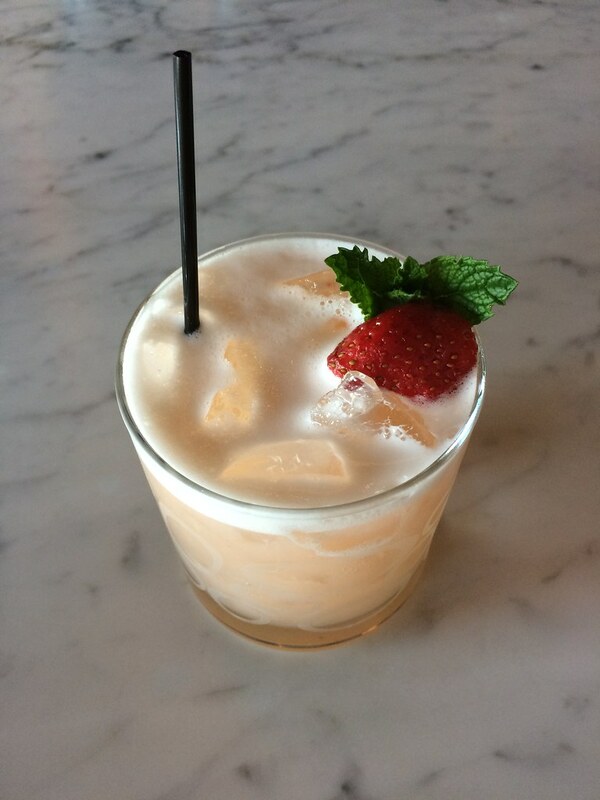 I had a PYO Fizz, with Barr Hall gin, strawberries, egg white and lemon. 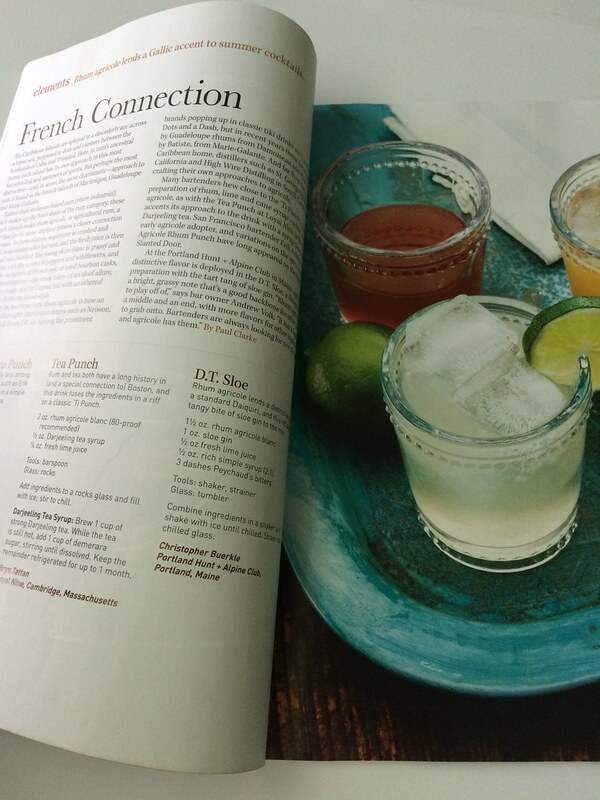 When the new copies of Bon Appetit and Imbibe magazines arrive at my house, I set to work finding the Portland, Maine reference. In Imbibe, our fair city is represented by a recipe for a D.T. Sloe from Portland Hunt & Alpine Club's Christopher Buerkle. It's sloe gin (gin flavored with tart sloe berries), rhum agricole, lime, and simple syrup. The D.T. Sloe is delightfully pink and comes neat in an adorable rocks glass. It's a good sipping (as opposed to swilling) drink. Try one the next time you're in there. 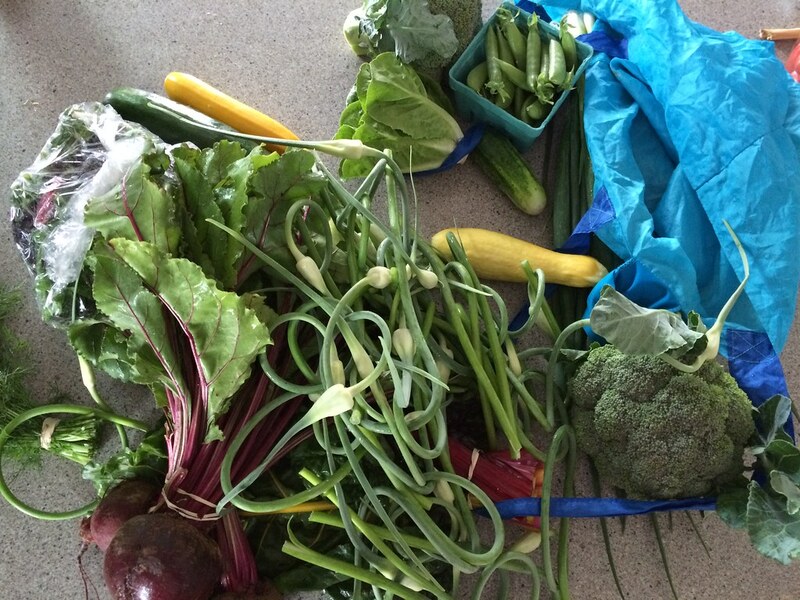 My CSA share from New Beat Farm is all, can't stop, won't stop. The scary thing is that we share a share with another couple and still can't keep up. I feel like Jessica Seinfeld, sneaking vegetables into dishes where they wouldn't otherwise appear. Beets in smoothies are my new vegetable disguise. 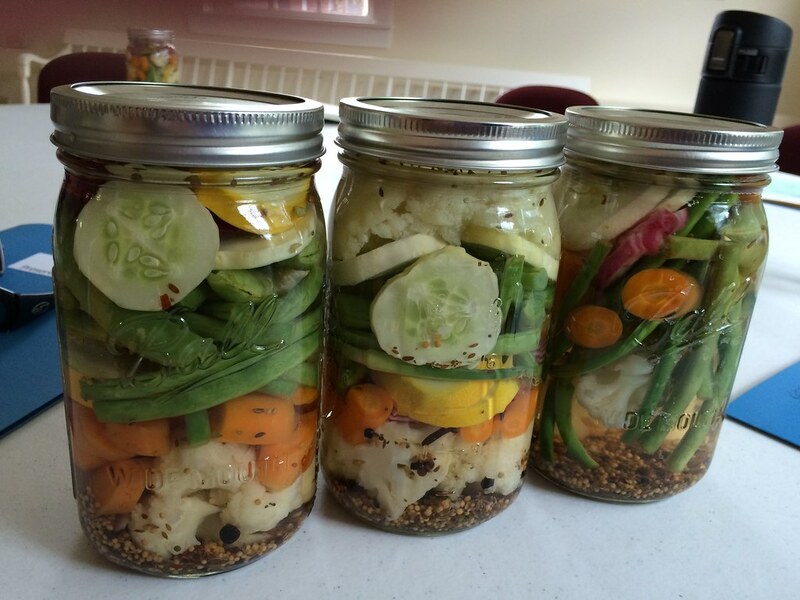 Of course, quick refrigerator pickles are always a good way to get the vegetables off of your to-do list. I made a quick brine of equal parts white vinegar and water, a few tablespoons of salt, - then add spices of your choosing (dill seed, mustard seed, peppercorns, crushed red pepper flakes, garlic). I pickled zucchini slices, snap peas, red onions, garlic scapes, carrot chunks, green beans, and cauliflower florets - those last three veggies I blanched briefly to improve their texture. These pickles disappear fast when added to an al fresco appetizer tray - crackers, hummus, olives, cheese. It's nice to have a fairly virtuous item to round out all the otherwise indulgent snack options. 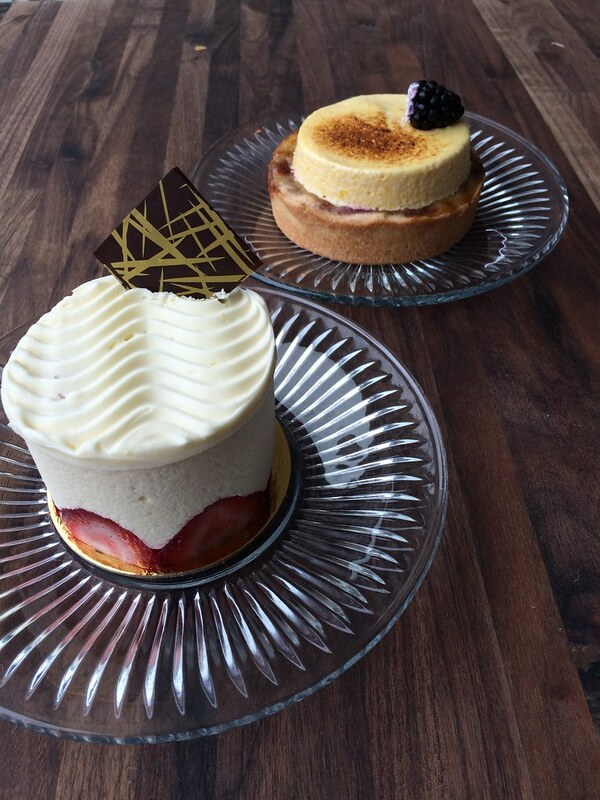 Portland Patisserie has indulgent covered, however. But surprisingly, these sweets are so well-balanced that they won't leave you feeling like you've gained several cavities or pounds. Roomie A. and I split these two - a frazier (strawberry cake) and a passion fruit blackberry chiboust - and didn't want to die afterwards. Au contraire! Their cherry pastry made me want to cry. I didn't realize breakfast pastry could be so good. And you know what? I was fine not knowing. No reason to indulge. Now I can't stop thinking about them. Woe is me! Last week, I found myself with time to kill in Kennebunkport - one of my favorite Maine villages to kill time in. There was no line at the Clam Shack (gasp!) so I thought I'd finally cross their lobster roll off my bucket list (what, you don't have a lobster roll bucket list?). And it was delicious. I got to choose butter, mayonnaise, or both...and I bet you can guess which one I went with. 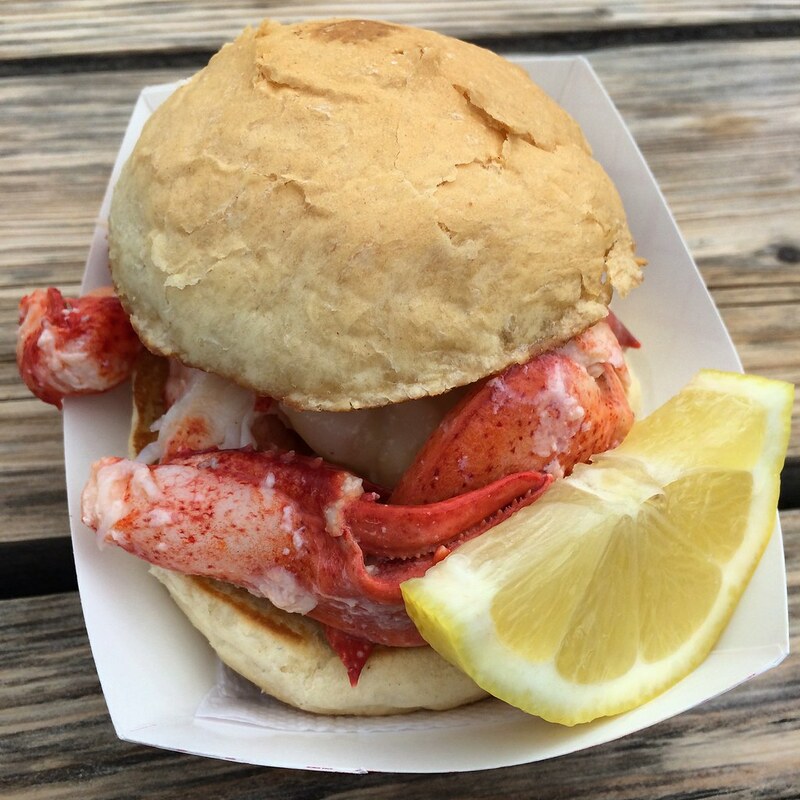 The roll was buttered, grilled, and then spread with mayonnaise, and warm butter drizzled on the lobster meat. Let's get back to it - there's still so much summer to be had. Our sailboat is in the shop. Not ideal timing, in the middle of July. But the upside is (and I'm searching hard for an upside), we get to use our weekends to do summer things that we'd otherwise skip in favor of sailing on Casco Bay. So that's how I discovered that I am a lake person. 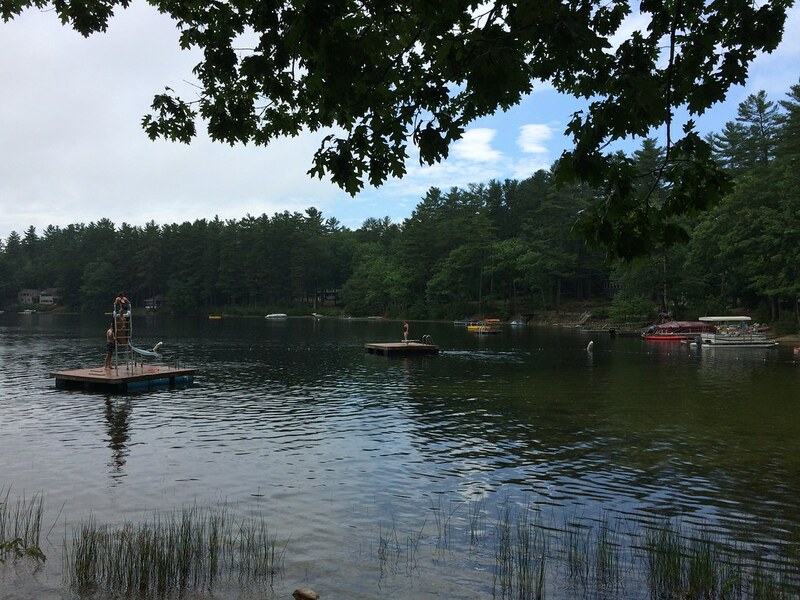 I don't think I had ever been to a Maine lake in the summertime before. But yesterday was the perfect time to go, when the thunderstorms were rolling through creating a thick coastal fog. It was sunny and 75* up in New Gloucester or at least after those thunderstorms passed. We headed to the northern end of Sabbathday Lake, lured to Outlet Beach by Bresca and the Honey Bee. Former Portland restaurant owners and chefs, Krista Kern Desjarlais and Erik Desjarlais bought the Snack Shack a few years ago (3 now?) and are serving really awesome lakeside food, cooked over a wood-fired grill. When we first arrived at the lake, we had a little rain left to wait out, so we made a blanket tent on the picnic table and read books under it in the drizzle. When the rain stopped, the grill was fired up again, and we went over to the shack for lunch. The service is casual - order at a window and your food will be delivered a while later on a cheery red plastic tray. There's picnic tables (some covered) around the beach on which to eat. 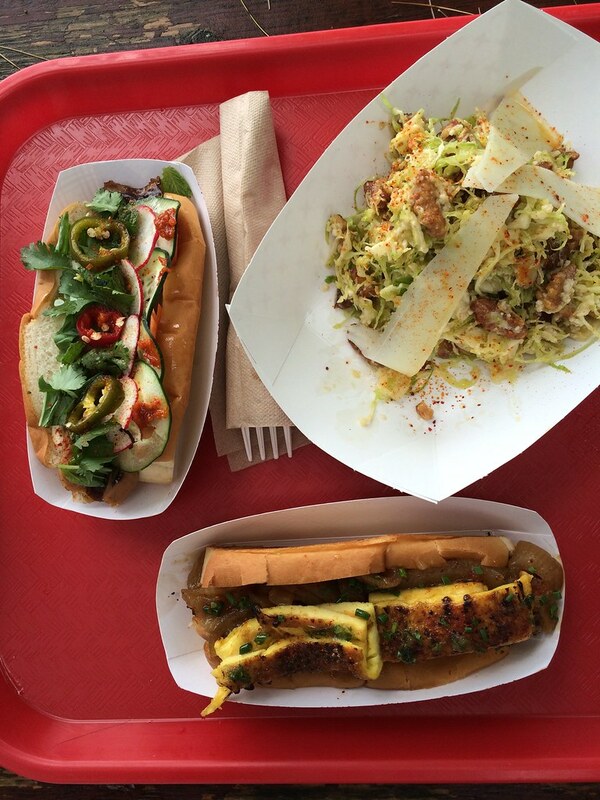 The menu is (mostly) hot dogs, hamburgers, and salads; we went with two dogs and the Bresca shaved Brussels sprouts salad with pecorino, candied walnuts, and a roasted garlic dressing. I had the Indochine dog, with pickled carrot, radish, cilantro, basil, Fresno chili, cucumber, citrus chili, mayo and hoisin - spicy! and delicious. A. had the Canuk dog with smoked cheddar, caramelized onion, maple brûlée omelet, and herb relish - the omelet was amazingly crunchy and sweet, a fantastic and unusual hot dog topping. After lunch, we took our inflatable dinghy out across the lake, and then killed the engine and floated in the sun until we got hot. A quick dip off the side into the cool, clear, blissfully fresh, and shark-free water had me hooked. I love lake, especially one with food as good as at Outlet Beach. **Outlet Beach and the Snack Shack are cash only for food, beach admission, and boat launch rates. Distilled in Maine Launch Party and Events! My second book, Distilled in Maine: A History of Libations, Temperance & Craft Spirits, is now available! I feel like I found the groove when I wrote this one, so I hope you enjoy it. It begins with the history of alcohol in Maine, starting with the earliest European explorers who brought brandy and wine and then the exhaustive work of Portland's mayor Neal Dow who was hellbent on ridding our state of alcohol and its attendant evils. Of course that never happened, so there's plenty of tales of coastal smuggling and high-speed (for the 1920s) car chases. The second half of the book profile the nine (at the time) craft distillers in the state from the earliest Cold River potato vodka to the new wave of Portland distillers like Maine Craft Distilling and New England Distilling. One of the most exciting things about the book is that famed Portland John Myers, currently of Portland Hunt & Alpine Club, wrote the foreword! John is entertaining, witty, and a good writer. At times I feel like he should have written the book, but I was asked, so there you have it. The books are available through independent bookstores like Sherman's Books and Longfellow Books in Portland, online, and at Books-A-Million. I'm having a launch party this Friday at Sherman's Books (49 Exchange St) from 5-7pm. Stop in and say hello! I'll be signing books and there will be sample cocktails. I'll also be at the Rails, Tails & Ales at the Boothbay Railway Village this Saturday, July 18th from 12-4pm. There will be live music, beer from several Maine craft breweries, and even train rides. Sounds like great fun, I only wish my nephew was still visiting to enjoy it! 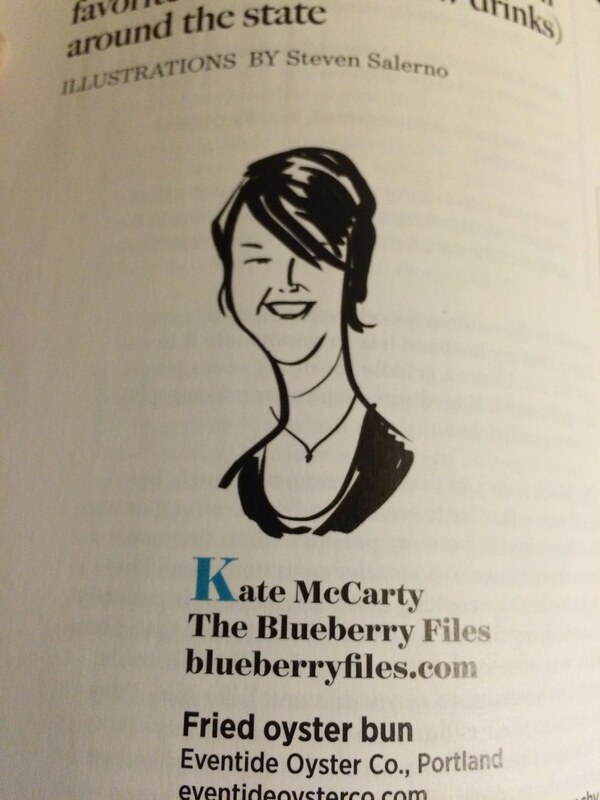 Also, pick up the latest copy of Zest magazine to see amazing caricatures of local food writers along with our top 5 dishes and drinks around the state. I got mine at the Rosemont market on the Hill, but you should be seeing them around - there's a big, beautiful enticing shot of ice cream sandwiches on the cover. Hope to see you at an upcoming book event! Although I rarely make it to other dining spots outside of Portland (not for lack of wanting! ), I've become increasingly familiar with the small but high-quality food scene in Kittery, thanks to some friends in that area who give me the inside scoop. 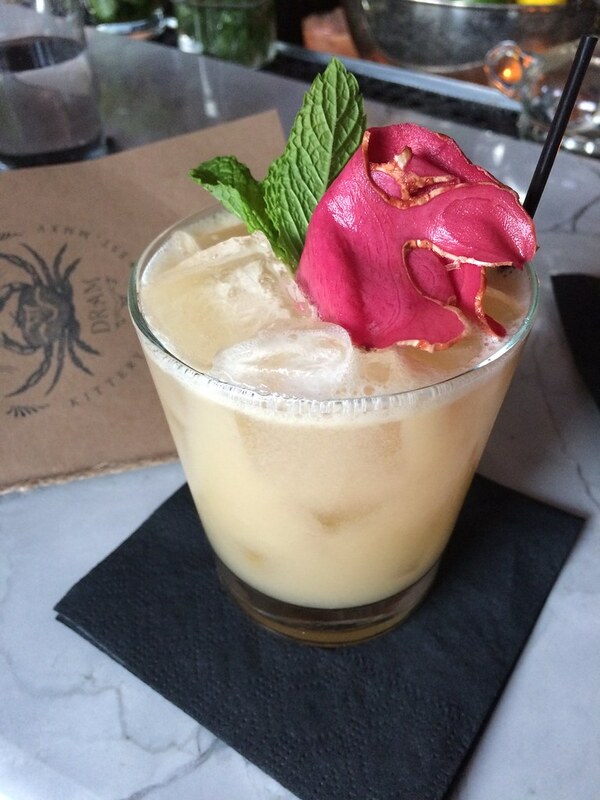 I've visited the Black Birch and Anju Noodle Bar, and enjoyed each immensely, so when I heard the owners of Anju were opening a cocktail bar next to their restaurant, I made the trip south from Portland to check it out. I met Deb and Lauren there for happy hour, and invited Original Roomie A. along too, figuring she'd enjoy the experience as much as I would. We rolled into Kittery on a midweek night, but found little parking and a line out the door of the Black Birch. Looks like the locals don't mess around. We strolled down the foreside, not entirely sure where we were headed, but I knew that it was next door to Anju. We missed the bar on our first pass, and so we stopped into Anju to ask, where the host led us through the back door of the restaurant into a hallway, opened an unmarked door, and directed us into the back of the Wallingford Dram. Our entrance lent the diminutive bar a speakeasy vibe, but the actual front door is around the corner from Anju, should you chose to go that route. We sat at the bar, taking up 4 of the maybe 20 seats in the house. The bar's wood paneling, dark green walls and low lighting gave the place a cozy British pub feeling, and the loads of fresh fruit and herbs, and jars of housemade syrups, bitters, and tinctures let you know the places takes its cocktails seriously. The cocktail menu is at least 6 pages long, so I took my time in ordering - having great difficulty narrowing it down, but deciding to go with the Golden Hour: reposado tequila, fino sherry, house apricot liqueur, chipotle cinnamon agave nectar, lime juice, served over ice with a spicy chili rim. I was also tempted by the Yard Gate Punch: blend of rums, allspice dram, grenadine, lime, bitters, nutmeg, and the Dovetail, a riff on a paloma with mezcal, tequila, grapefruit liqueur, grapefruit juice, salt, lime, and egg white (I'm a sucker for an egg white drink). A. chose the East By Gimlet, with gin, house lime cordial, lime, lemongrass, curry leaf, and fenugreek. As you might imagine, these unusual cocktail spices made for a very refreshing summer cooler. We caught up with my friends, snacked on some spiced nuts and some welsh rarebit, then decided we could share a Mai Tai and still be okay to drive. This version was delightfully tart (I might be becoming disillusioned with my RumDood recipe, as I think it borders on too sweet), and was garnished with some vibrant pickled ginger. 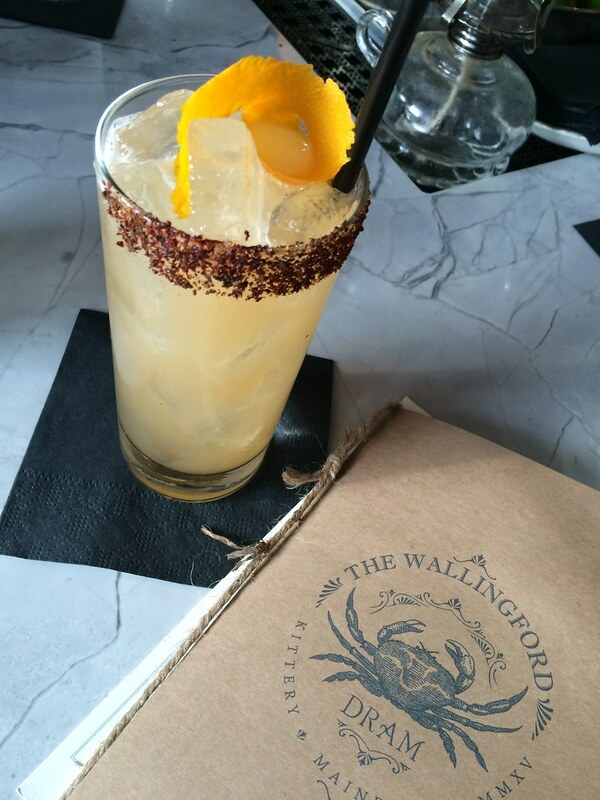 I'm looking forward to returning to the Wallingford to work my way through their expansive cocktail list, and Portlanders should add it to their list of things worth the trip out of town for.